The Jayco Silverline Outback is a luxury van with the added bonus of being able to open up with a movable lateral extension to create a large interior with clever layout and a very comfortable environment to enjoy internally. Life on the road was great except these travellers didn’t have the freedom they wanted because they were constrained by a lack of power. 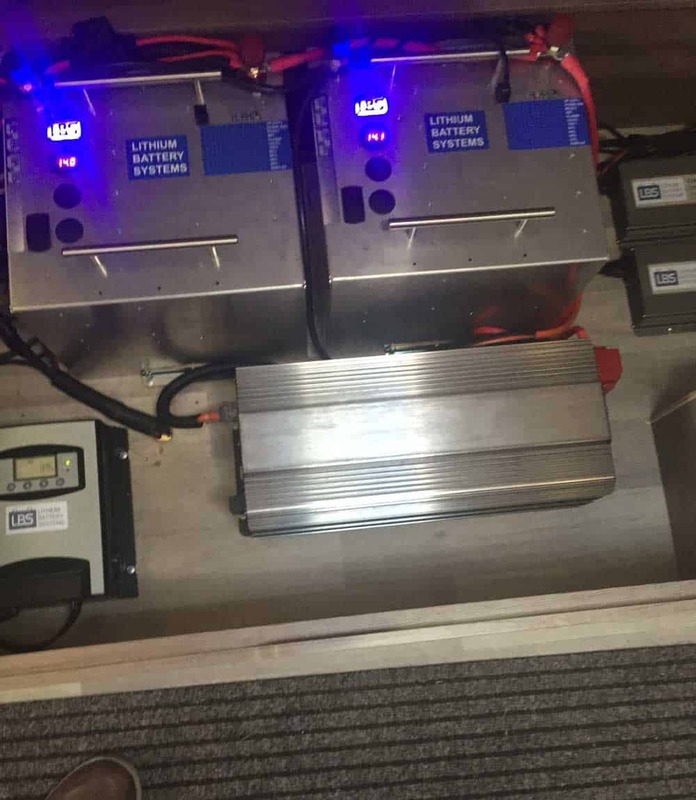 The current batteries in the van were 2 x 180Ah Ritar AGM batteries and were simply not cutting the mustard. 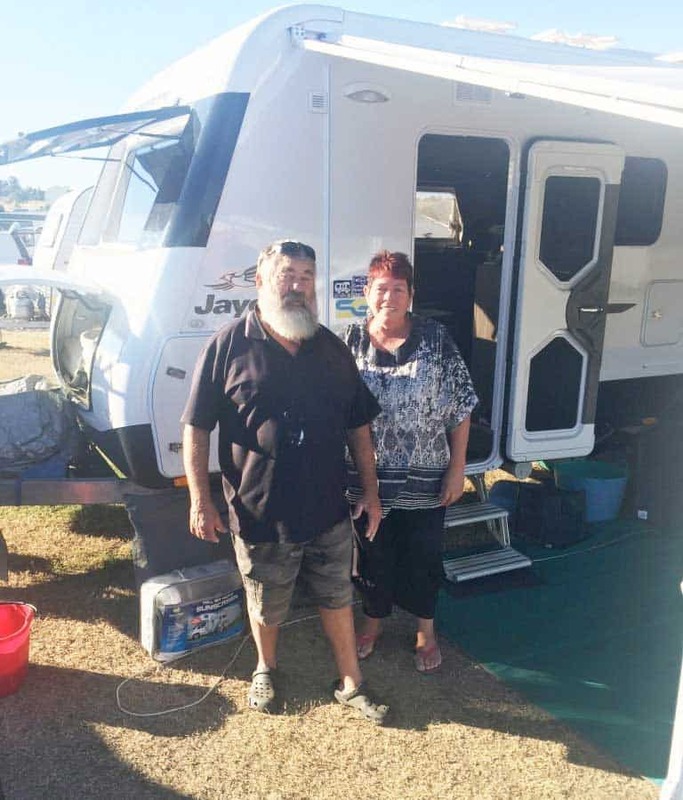 Our travellers wanted to watch Foxtel at night, cook their dinner with a microwave, make a coffee in the morning with their coffee machine, use a diesel heater that requires power on cold nights and use all the standard appliances we all take for granted. Nothing out of the ordinary for a couple on the road but the power required meant they were always out of battery capacity unless they were plugged in to park power. Being plugged in was the problem. To experience all of the great sights on the road means being unplugged and going wherever suits. Also, when using caravan parks, it is always a cheaper option to choose an unpowered site. This couple decided it was time for the lithium makeover. An upgrade that added some powerful components including 4 new solar panels but actually cut down on their overall weight. These were chosen to optimise the available space on the roof which was the entire length of the van but only approximately 600mm wide. The panels are 510mm wide so with the space required for brackets there were a perfect fit. Three were placed for the length and the 4th panel was mounted laterally across at the front. White moulded, UV rated, plastic brackets were used because they look good and gave good surface area to bond to the roof. No piercings were made in the roof and the brackets were fixed using high quality Sikaflex 291 which is marine grade bonding agent with a tensile rating of 225psi and an elongation rating of 600%. 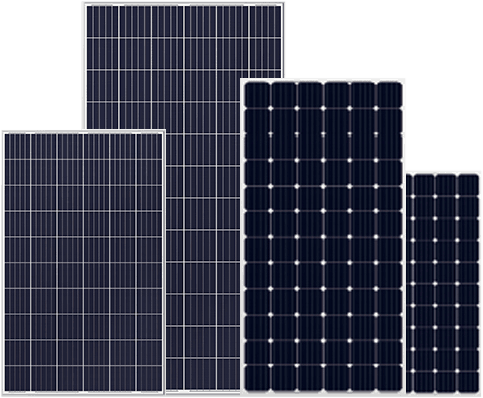 The panels weigh approximately 8.5kg and so this is within safety limits by orders of magnitude. 2 units were used so that if they were plugged in they could take maximum power into their batteries as quickly as possible. Sometimes there is free power at road stops and being able to quickly add power meant more freedom. These were chosen to give ample headroom for capacity and power and ensure they could last many days without compromising their freedom. These batteries weighed less than the previous batteries but are more than double the capacity. The AC inverter was chosen to power up their air conditioner. This was not possible previously unless plugged into park power. This was a great improvement and meant that even when free camping you could use the air conditioner. It also meant that all the AC appliances including coffee machine, washing machine, microwave, water heater and lots of little appliances and chargers could all be used from battery power. This dramatically powered their freedom to choose to live their normal daily routine without being tethered to power. This can be built into the batteries but in this case an external unit was used to handle the new 520W of additional solar capacity taken on-board. Placed conveniently so that at a glance they were able to see the current state of their power reserves with a single number and graph. It acts like a fuel gauge. In a glance you can see you are almost full, look more carefully and you can see you are sitting at 89%. Hit the button once and get an accurate understanding of how many Amps are going in or going out and then tell you at the current rate when you will be full (if charging) or empty if you are using power. Hit the button again and there is detailed temperature and cell data that is interesting to technicians or the more advanced user. A major design requirement was to seamlessly fit in with the current electrical system in the Jayco. 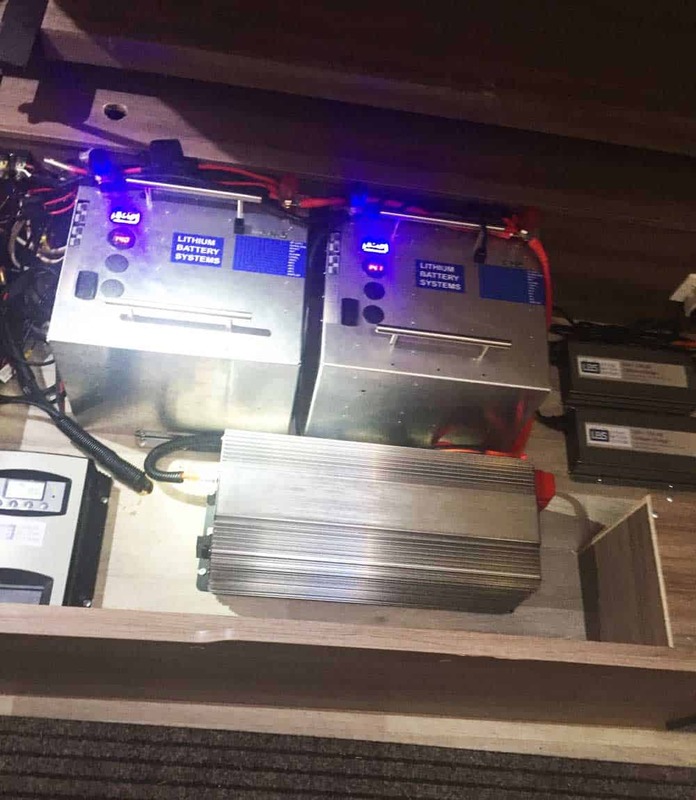 The current AC charger, DC distribution system, MPPT controller and the Anderson connection to the towing vehicle were left untouched and wired into the new system and all worked together perfectly. All panels can be charging the batteries whilst driving and also the charge from the towing vehicle was simultaneously entering the charging stream. This major upgrade to the electrical system produced a great outcome for these travellers and yet everything remained the same to use. 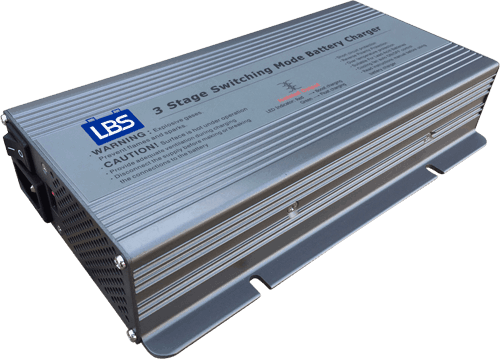 Without any disruption the total system was installed over 2 days by Lithium Battery Systems. 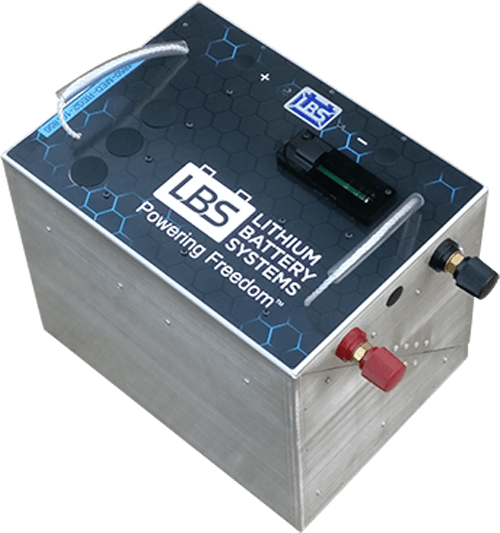 Call LBS today for a free phone consultation about converting your RV to lithium so you too can experience a significant weight saving and more power at your finger tips. That’s what we call POWERING FREEDOM!